Today was rather uneventful for Aidan. Laura was watching him and saw him move his arm when he wasn't supposed to and succeeded in convincing the resident on duty to increase his Midazolam and Vecuronium doses so he's less likely to move. 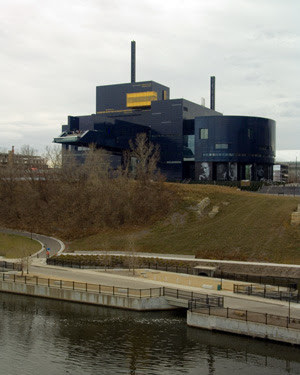 Laura and I then went to the Guthrie Theater on the West Bank of the Mississippi River to see Private Lives. The play was really good it took our minds off our situation for a little while, although Laura wanted to go at Intermission because she missed Aidan. While the play was really good what I thought was cool was the theater house. The building itself is very pretty and we noticed it when we were on the Stone Arch Bridge with Dziadzi "Grandpa". The Building also has this overlook and a really good view of the Interstate 35W Bridge that fell down. I took a few pictures and made a nice Panorama of the view for you all. After the play we went and visited Aidan again because we wanted to say goodnight to him. We don't sleep very well unless we say goodnight to him and read him a story.